We have just received word that little Roo, the 2 year old son of James Mansaray (our director of Nazareth House operations in Freetown, Sierra Leone) has taken ill. He was fine this afternoon and suddenly spiked a exceptionally high fever, chills and is unresponsive. James and Kadijah took him to several area clinics and hospitals tonight only to be ignored. It is night and they must come back in the morning. They have taken Roo back to St. Laurence House. They have given him Children's Tylenol and I have instructed them to bathe him in cool water to bring the fever down. They will try a hospital again in the morning. Please keep him and the family in your prayers as they face this difficult time. I was recently asked: "What does Nazareth House need to operate and what are your expenses?" Our first priority is to establish a permanent center of operations in Freetown, i.e.our own compound. For many reasons, the most practical location for the compound is Freetown, the capital city of Sierra Leone. As you are well aware, Communication between Nazareth House supporters and those we serve is very important to our work. It enables the flourishing of relationship. Through the blog, Youtube and the website we meet and get to know each other. 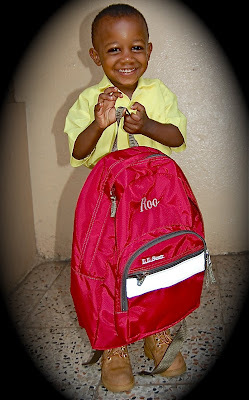 We learn in detail where our donations are going and how it makes a difference collectively and per each individual. In return the recipient also knows about the donor. Internet communication at the level that we expect and depend on is best accomplished in Freetown. It is also the port in which supplies reach our staff. 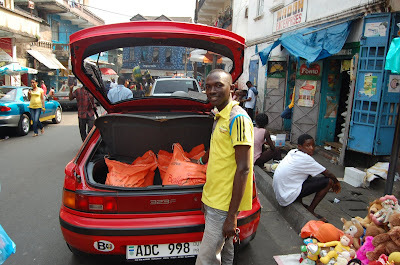 The accessibility of Freetown, the availability of supplies, etc. make it the prime choice for operations. Many worked very hard to pay this year's rent for St. Laurence House, our rented operations center. We have until next March on the current lease. We must own our own property before that time lapses. Time flies by, we need to work very hard to accomplish this goal quickly. There are too many depending on us to survive for us to let this go by the wayside. We have all worked too hard and changed so much to stop now. We must carry on. Special Donations for the compound should be sent noted "Compound Fund". Nazareth House's general expenses run at $2000.00 per month. This includes the salaries of 5 teachers at the Kabala School and salary for the school's Superintendent. There are no salaries for administration, etc. of those who work for Nazareth House in the United States. It is all volunteer. 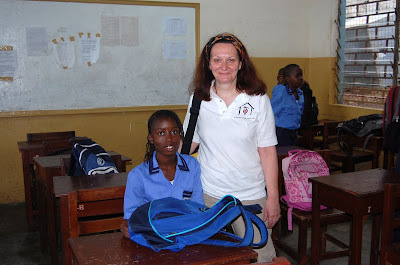 The teachers are responsible for well over 200 students as well as administration for the school in Kabala. Pa Foday, a most capable Superintendent, not only supervises it all, he also supervises each of the students personal lives i.e. he faithfully drives his dilapidated motorbike checking on the living conditions, proper assembly and usage of mosquito netting, family health of each and every student. Not to mention, he also works and maintains the village farm. Pa Foday is in desperate need of a new motorbike to do this task. The children live great distances from the school. Special Donations for a new motorbike should be sent noted "NHA School Motorbike". 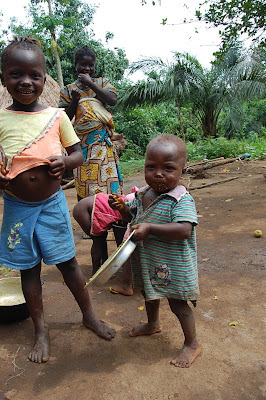 In addition to the salaries and monthly maintenance and supplies for NHA School and its students, Nazareth House monthly expenses include feeding several families in Freetown and various villages between Freetown and Kabala, especially Two Hut Village. We cover medical fees and medications, school fees in and around St. Laurence House, and maintain our staff as well as utilities for our rented center of operations. It is truly amazing how much we are doing with so little. This is because God can do big with small. When we think we are not big enough or capable of providing the need, God says "IAM". Our income barely covers the monthly expenses. There are some months it doesn't make it and people must go without. This is the reason for our campaign to secure minimum $25 monthly donations. The more people that are giving $25 a month, the more we can do for the men, women and children who are without food or are surviving on a single meal a day, dying of curable diseases, living uneducated, etc. We must spread the word and generate more support. If you haven't already committed to a monthly donation please consider doing so today. 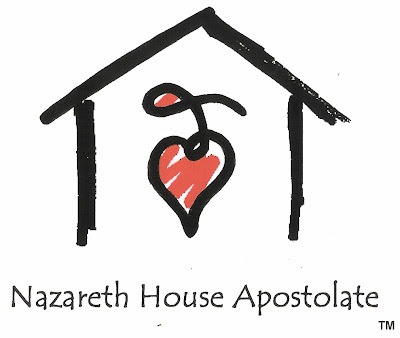 Monthly Donations can be mailed each month to Nazareth House Apostolate at 2216 Goldsmith Lane, Louisville, KY 40218 or sent automatically through your Financial Institution's online billpay system. You may also pay through the website via paypal. Monthly income is our most crucial need at this time, without it, we cannot meet the needs of so many desperate people, as well as raise the funds to perpetuate our existence in Sierra Leone with our own compound. GOT SHOES? 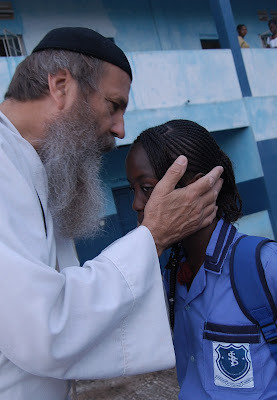 In addition to monthly support, we have partnered with One Love Foundation, Summit Hill and the students at Penn Kidder School in Pennsylvania to collect shoes for the students of our Kabala School and the children of St. Mary's Orphanage in Freetown. Be sure to Note Nazareth House Apostolate and your name on each shoe shipment. Shoes should be sent prior to May 23, 2009. Packed up and shipped from our headquarters in Louisville, Kentucky, supplies are arriving in Freetown for distribution in Sierra Leone. 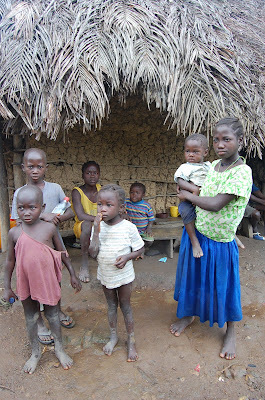 For the most part, it is all much needed medical supplies for Kabala area and Kroo Bay. All packages were packed with lots of love and hugs... Once the packages arrive in Freetown, the capital city of Sierra Leone, they are picked up by our Nazareth House staff and brought to St. Laurence House (our rented center of operations) to be sorted and distributed. Kadijah finds some hidden treasures for our staff in one box. Spaghetti (James favorite) beans, and processed cheese (Can't ship things that are perishable - and processed cheese just WON'T perish). Cheese, real cheese, is another hard to come by item in Salone - either unavailable or too expensive. Fresh bread ready and waiting, Kadijah jumps at the chance to make cheese sandwiches. 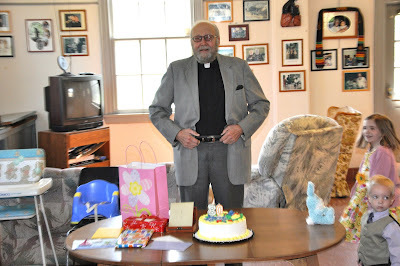 Deacon Tom remembered how much James likes Baked Beans. 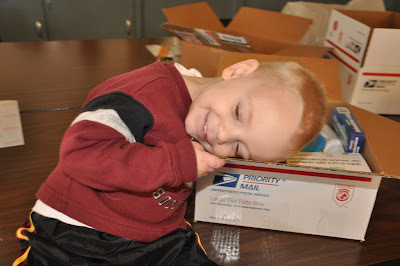 We had a box filled with hospital syringes and other supplies ready to ship. Though much needed, they are very light to ship. Priority Flat-Rate boxes are the same shipping price for 2 ounces or up to 20 pounds. 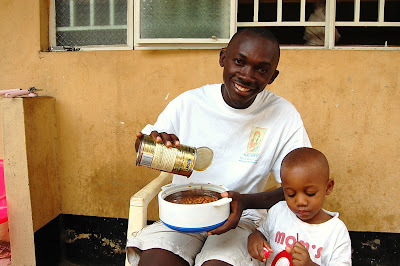 Since we had to ship the hospital items anyway, Deacon Tom packed with the syringes, a few cans of James favorite beans. Needless to say, James (and Roo) enjoyed them. I love how they fix them over rice. Everything is over RICE! It is always exciting to receive a package in the mail. 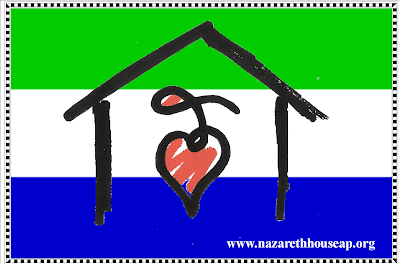 To live in Sierra Leone and receive a package from the Nazareth House Branches in the United States is even more exciting. You know that what you are receiving will benefit others as well as provide you and your family with a little something extra that otherwise would be impossible to have in Salone (either unavailable or too expensive to purchase). 3 more boxes arrived last week. 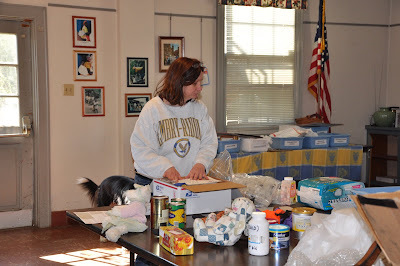 They contained medical supplies and a few goodies for our St. Laurence House staff. As you can see by the huge smile on little Roo's face, even used Barbie dolls can brighten your day. 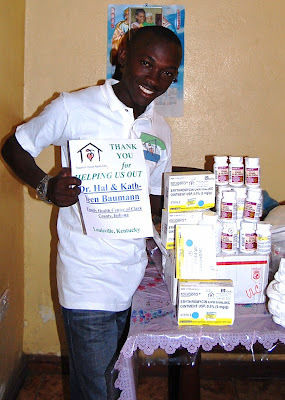 Sending items from USA to Sierra Leone is very cost prohibitive, however, we at NHA, from time to time find creative ways to use such things (as Barbies, Stuff animals) as packing material in with the medical supplies and medicines. It keeps bottles from rattling around or getting smashed. Arlene Rogers sent the Barbie Dolls, hoping to cheer a few little girls - however, looks like we'll have to pry them out of little Roo's hands. LOL! 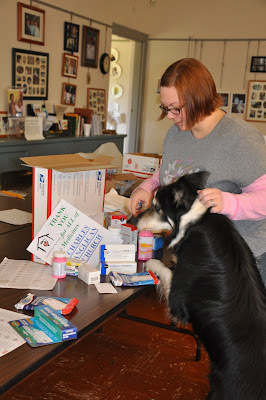 Lucy stands with the medicines sent by St. Charles Anglican Church, Huntsville, Alabama. 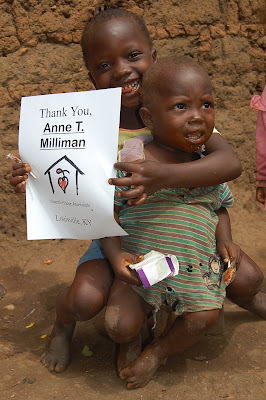 Ann Marie proudly shows off all the items that successfully traveled from Louisville to Freetown. The items here are for Kamasorie Village. 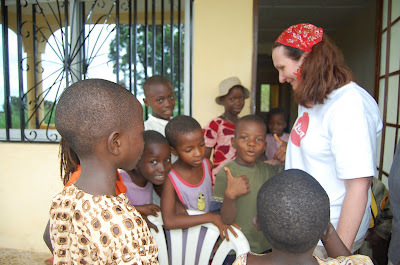 Many children are going blind in this village due to lack of Vitamin A.
James was especially happy to receive the coffee shipped from Liz Holt especially for him. Last visit, I left a stainless steel coffee press at St. Laurence House (The French Coffee press works best because it requires no filters or electricity) with a little bit of coffee. The common coffee found in Salone is freeze dried instant and for a coffee snob like me, this just wouldn't do. James had not tasted coffee like what I had brought from home and therefore rationed every last crumb. He was totally out by the time Liz replenished his supply. Oh, Mr. Roo, my SupaRoo, I miss you so much, especially that smile. James and Glenda Krapf through their daughter, Virginia sent some baby formula which will come in handy for those infants whose mothers are unable to breastfeed. 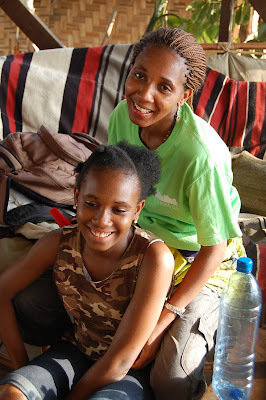 James and Glenda also just paid for Lucy and Ann Marie's next terms in school. 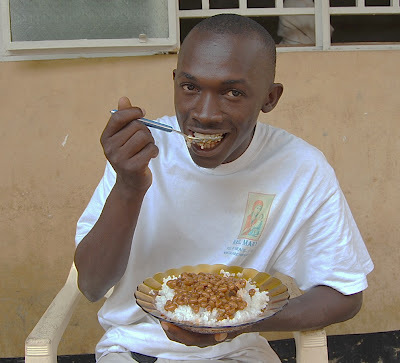 Deacon Tom sent some food stuffs that are difficult to find in Sierra Leone to St. Laurence House. New names/faces are being added daily to NHA. We are growing slowly but surely. As we grow, we are able to provide more and more to those in the cracks, abandoned, alone and hungry. Thank you. So many of you do so much for Nazareth House. 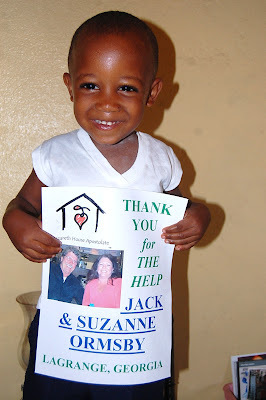 It is such a rewarding experience to be a part of this Nazareth House family. 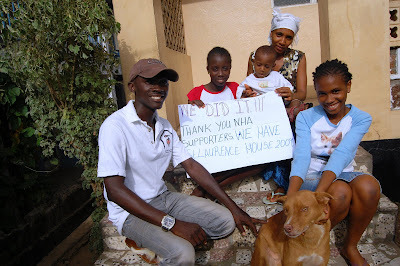 There is not enough storage space on this blog to allow me to post all the photos and names in order to thank everyone at once for their help to NHA. We will be thanking a few at a time as time goes on, keep checking the blog. Suffice it to say, we are most honored and grateful for your support and love for the people of Sierra Leone. Most especially we are delighted to see a slight response in our campaign to generate monthly support. Our goal is to have 1000 people donating regular monthly support. To date we have 20 people signed up, (6 using automatic billpay through their online banking) - long way to go to meet our goal. But there was a time when we thought building a school in Kabala was impossible... At Nazareth House, we are into duration, we don't give up - too many lives depend on it. 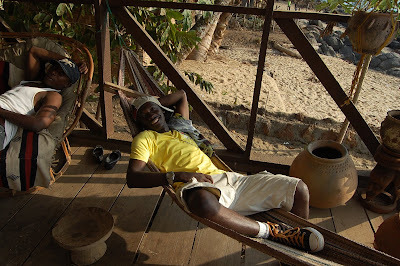 NHA Sierra Leone staff and friends slip away for a day of relaxation at the beach. The sun is hot these days in Salone and NHA work can take a lot out of you, spiritually and physically. It is important that our staff takes a break from time to time AND there is no prettier beaches in the world than in Sierra Leone. Above James and Kadijah and little Roo. Below Lucy poses on the gorgeous beach. Kadijah takes time to fix Lucy's hair. or to relax in the ocean breeze on the porch..
Mama Vicki, always worrying about James, is especially happy to see him get some much deserved rest! Note: Ann Marie bogged down with school work, chose to remain at home to stay ahead on her lessons. Ann Marie is studying to become a lawyer. She told Fr. Seraphim that in her country lawyers are available for those who are rich and have power. 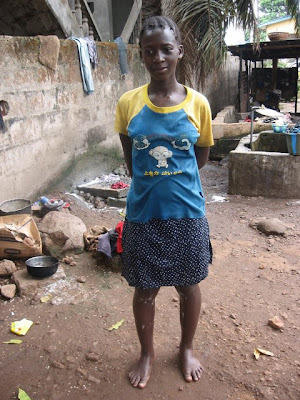 She wants to become a lawyer in her country for those that are poor.